It's official! A year has gone by, and the Achievements system is still running strong. In 12 months, over 6,500 achievements have been earned! I'm always pleased to hear in discussions or chat rooms, players going to their achievement list when they can't decide what to play each week. This new facet of Organized Play has quickly become a fixture in the player community. Today, a new set of achievements goes live, some changes have been made to help streamline future achievement cycles, and a few new features and rewards have been integrated into the system. I hinted at some changes coming, both on podcasts and in earlier articles. A handful of adjustments were made to some existing achievements, largely to accommodate the rapid growth of the achievements program, and keep things within the established naming conventions. These will be enumerated in the FAQ as well as this article, for future reference. First are the Double and Triple HQ achievements. It has become apparent that this is a popular form of play in 2E, with significant advantages and pitfalls all its own. Last time, we added win versions of these, but to further encourage this angle of play, both the Double Down and Triple Trouble achievements have now been expanded to include full cycles. To streamline these cycles in with our other HQ oriented achievement cycles, the names of the Win versions have been match to the Play version, but with the "Victor" suffix, and the unique title for the cycle has instead been applied to the Play 10 iteration in the cycle. No achievements will be lost in this adjustment, just names changed. These cycles will also be retroactive, so there may even be a few achievements gained in this change! This release will also see the first release of new point values on achievements, as well as the adjustment of values on a few existing achievements. First off, several new achievements, while in the style of some existing 10 point achievements, will only be worth 5 points. The reasoning behind this is that 10 point deckbuilding and dilemma achievements were never meant to be played at the same time. While large and unwieldy, it is currently possible to earn most of the original dilemma pile achievements in one deck. This was not the intention of this system. It was meant to encourage trying new things, not trying new things all at once then returning to business as usual. As such, any NEW achievement that is easily combined with a similar achievement type (dilemma, deckbuilding) is only worth 5 points. Achievements that by their nature exclude earning other achievements simultaneously ("Play only X cards.") will be worth 10 points. While it was considered to make this a retroactive change to correct this oversight to previous achievements, the final decision was made to leave them, as it would cause a bit too much upheaval in the existing points structure, and we didn't want to take points away from anyone. The largest balancing factor being that early achievements are still equally available for everyone to earn. Conversely, a few truly significant achievement feats have had their point value increased. Diverse collecting achievements that require a great deal of effort to earn, such as Fifteen Down and None to Go have had their values raised to a whopping 25 points to greater encourage players to try for these big achievements and reward their diverse efforts! A major shift in the Organized Play landscape is the correction of an oversight on the TD and Reporting achievement cycles. While some of these were written as "any sanctioned tournament," they were intended to include both 1E and 2E. The swell in Tribbles popularity was a pleasant surprise and not anticipated for inclusion, but by virtue of not excluding them they were included in many generic "any tournament" achievements. While we are all big fans of Tribbles, it is obvious that running a Tribbles tournament or writing a Tribbles report are far less work than doing the same for 1E and 2E. As such, it is not fair to have a reward meant for TDs maintaining their the game knowledge, making rulings, and organizing multi-hour events be equally granted to someone sitting down for 45 minutes to play Tribbles. The same holds true for Reports. As such, we are correcting this error; Tribbles tournaments have been retroactively removed from eligibility for the Reporter, Judge, Many-Player, New-Player, and Documentation achievement cycles, and achievement points recalculated appropriately. For some people, this will result in the unfortunate loss of some cumulative achievements in these areas, which is regrettable, but we hope these players and TDs will understand this necessary correction to define these achievements as originally intended. There will still be the separate Tribbles Director and Tribbles Reporter achievements available as rewards for that game. Along with all of the changes, there will, of course, be new achievements as well. On the organized play side, we're encouraging timely play with an achievement for winning games within the time limit, playing format decks in off-format tournaments, and a special achievement to those TDs who have to 'Take One For the Team' and sit out a tournament to avoid the dreaded bye round. Okay, let's get down to what you really want to see; new deck building achievements! There were a number of diversity-oriented achievements last time, so this round, we've got several more focused deck achievements for you. A new species-oriented achievement rewards you for using (Play and Win versions) all Vulcans, while we look to the third icon slot to encourage use of icon personnel. A number of Keyword-related achievements are also included, rewarding decks for including a certain number ofInfiltrators and Infiltration cards, Thieves and Crime cards, Q-related cards, and Temporal cards. We also have a new cycle of achievements to celebrate the release of the 25th Second Edition expansion (Unity), involving play and win versions of decks that include at least one card from every set in your deck and/or your dilemma pile. There are a few new achievements earned by eschewing cards of certain rarities, a pair for limiting your 1E deck to the PAQ-era dilemmas, and of course, an assortment of a few new Tribbles achievements! THEY CALL ME MISTER NOG! For example, completing the achievement There and Back Again earns you the title "Explorer." World of Warcraft players will recognize this system as a reward that appears when others view your avatar in-game. With this title, players examining my character would see my name as "SirRogue the Explorer." But we don't really have in-game avatars, so how can you brag about your titles? Where else? On the message boards! When you are logged in, you will be able to view all of your earned Titles (if any) at the top of the My Achievements page. This will allow you to select one of your earned Title badges to be displayed on your Message Board posts. Only one of your Titles will be displayed at a given time, but you may change your selection as the mood suits you. The selected title badge will then appear above your avatar with your current Organized Play and Donor badges whenever you post on the boards! 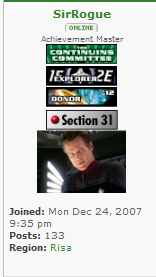 As with multiple OP and donor badges from years past, while only the current ones are visible on the boards, you can view the complete collection on your Profile page. Titles are also retroactive, so a few over-achievers who already have some of these high-level achievements may have Titles waiting for them already! We are very pleased with the variety of options and play encouragement brought in by this new collection of achievements as well as the groundwork laid for future releases. We hope you will enjoy achieving them as well!